You’ve proven your multi-trade skills under pressure as an operative. You’ve demonstrated problem-solving abilities with a thorough and enthusiastic manner. You’ve paid your dues. And now you’re looking to take the next step and become a property maintenance supervisor. So what does it take to move from being an operative to a supervisor? As a supervisor, you’ll utilise your experience as an operative to understand and organise project requirements. This is in addition to scheduling and co-ordinating operatives’ daily tasks, ensuring projects are delivered to the highest standards. Supervisors are often drawn from the operative team because of work ethic, positive company attitude, a commitment to quality, leadership skills and a proven track record within various environments, whether a new-build or site work. But the difference between a good supervisor and a great supervisor is quality communication and people skills. You will be delivering project instructions and direction, often to large groups and in potentially dangerous situations. Therefore, it is essential that you provide clear instructions, ensuring every operative understands their role and responsibilities. A supervisors’ hours can be long and deadlines will require early starts and late finishes. However there will be the reward of leading a team to discover the solution to a problem ensuring a customer’s life gets back on track. It goes without saying that you must be driven and a hard worker. As supervisor, you are an example to the operatives ensuring correct procedures are in place and that best practice is observed. You will have already demonstrated a dedication to perfection during your time as an operative and it is now your responsibility to ensure the team have the same eye for detail and commitment to excellence. No two days are the same. Once one challenge has been overcome, there will be another around the corner ready to bring out the best in you. You will need to be proficient in strategic planning, leadership, managing budgets, troubleshooting, technical understanding, equipment maintenance, teamwork, job knowledge and of course, the obligatory health and safety. You will monitor health & safety of all contractors and sub-contractors and conduct audits to ensure that all are working safely using the correct equipment in the correct manner in compliance with all legislation. The role can be a challenging one. You may need to navigate the tricky transition from being one of the operative team to now becoming the individual responsible for guiding work and providing feedback, positive and negative, whilst liaising with the managerial team. There is additional responsibility as a supervisor, but with this increased role, there are great benefits. You have experience, you have the trade skills, but becoming a supervisor provides opportunities for personal progression like never before. You will be under pressure and making hard decisions, and here’s the thing, not every decision will be 100% right. There will be bumps in the road along the way as you develop into the role. Whilst you may think that those days where things don’t go the way you’d hoped or planned are your worst – they can be your best as learning from a mistake will make you a better supervisor, and a provide real-life on-site experience and advise you can use to help improve the operative team. Like a captain on the pitch, you will be required to know the job at hand inside out, leading operatives by example to get the best out of them and oversee a positive outcome to all the work being completed, resulting in a happy customer. As the role of a supervisor has more managerial responsibility, there is more opportunity to pass on your knowledge to others. Beyond the incentive of increased financial reward, the role could also be the gateway to becoming an Assistant Manager or a higher managerial position. Managing Director, Andrew Orme said, “At Elite, we reward and support all members of the team. We employ the right people and as an operative if you show the hard-working commitment to quality of work and excellence, you will have the chance to progress. “Our entire team go above and beyond to provide the best, professionally delivered service to happy customers. 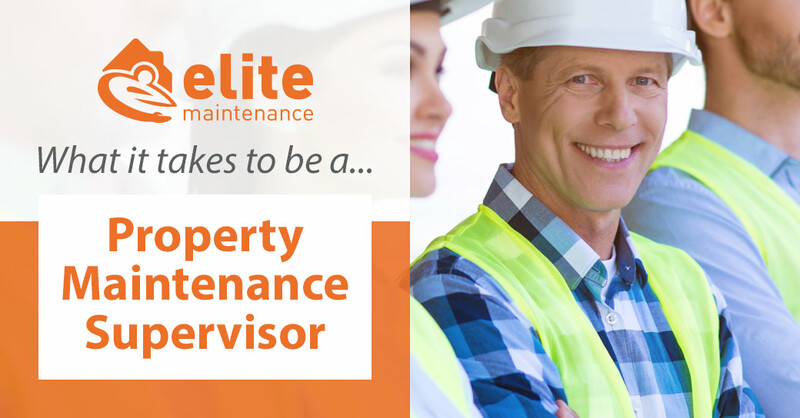 We’re always interested to hear from potential Property Maintenance Supervisors who have what it takes to supervise operatives and work at Elite, so why not check to see if we’re recruiting in your area? Visit https://www.elitemaintenance.co.uk/careers and apply online today! "The guys did a fantastic job, very happy." "Very happy with the impact damage repair works that were completed by Elite, the Brick Layer who attended was great. Thanks!"